This Joint Announcement was released at the conclusion of the annual U.S.–Japan Consultations on the Civil Use of the Global Positioning System held May 24, 2007, in Washington, D.C. 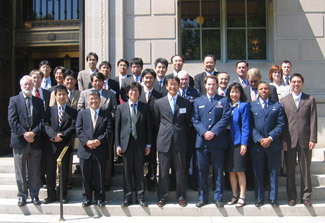 The Government of the United States of America and the Government of Japan convened a plenary meeting in Washington, D.C., on May 24, 2007, to review and discuss matters of importance regarding cooperation in the civil use of the Global Positioning System (GPS) and its augmentations. Such consultations are held regularly pursuant to the "Joint Statement on Cooperation in the Use of the GPS" issued by the then heads of the two Governments on September 22, 1998. During the meeting, the United States representatives provided an update on the implementation of the National Space-Based Positioning, Navigation, and Timing (PNT) Policy. They also described the status of GPS modernization and the United States' international cooperation with third parties. Japan representatives reported the recent development in the Diet which passed the bill regarding the advancement of utilizing geo-spatial information, including measures related to space-based PNT. Both Governments reaffirmed the importance of providing open access to space-based PNT services for peaceful purposes, free of direct user fees. The Japanese representatives provided an update on the status of the Multi-functional Transport Satellite (MTSAT) Satellite-based Augmentation System (MSAS) and the current status of the first Quasi-Zenith Satellite System (QZSS) satellite, which began development in 2006. Representatives of both Governments reviewed the ongoing work of the U.S.–Japan GPS/QZSS Technical Working Group (TWG), which was established for close cooperation during the development of QZSS and mutual cooperation in International Telecommunication Union activities. The TWG reaffirmed that GPS and QZSS are designed to be interoperable and compatible. They continued discussions on possible cooperation related to QZSS Monitoring Stations and Two-Way Satellite Time and Frequency Transfer. Today's consultations strengthened cooperative relations between the United States and Japan. Both Governments acknowledged the important potential contribution of QZSS to the spaced-based PNT services of Japan. They affirmed that continued close cooperation in the area of satellite navigation will contribute to the peaceful development of the Asia–Pacific region and promote global economic growth.